No pre-drilling; automatic 3/16" spacing. Attaches directly to the joist, which reduces board movement. 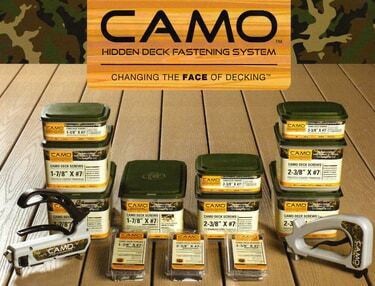 Leaves a fastener free surface. Easy to change out a board that needs replacing. Pro-tech coated screws with 1500 hour salt-spray rating. Stainless-steel also available. 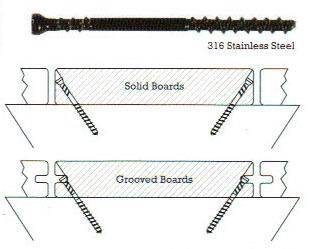 A reverse rake tip removes deck material as it bores, allowing the screw to penetrate the board without splitting. Star drive head offers more points of contact for better performance and reduces bit slippage and wear. An aggressive lower thread pattern provides superior holding power while the reverse upper thread pulls the board tight to the joist and provides a clean, finished entry. A unique trimhead design provides a less visible point of entry. Two different driver bits for if you going into solid or pre-grooved boards.